VCU Researcher Matt Balazik wrangles an Atlantic Sturgeon in the James River. Atlantic sturgeon are dinosaur-era fish with bony plates and sandpaper hide that were once the kings of the Chesapeake Bay and other waterways along the East Coast. These giants with long snouts, whiskers and soft mouths were once so common that during their spring spawning runs up rivers, their bodies – sometimes 15 feet long and 800 pounds – would crowd streams like living logjams. Sturgeon were a mainstay in the diet of many Native Americans, who speared the fish from canoes and used every part of the animals. English colonists, however, regarded sturgeon mostly as nuisance and a trash fish. That was until the 1870's, when a vast industry developed to slaughter sturgeon for their eggs, also known as caviar. By 1900, virtually all sturgeon in North America were wiped out – the passive creatures speared by the millions as they traveled up streams, their bodies left to rot. And then the caviar industry moved on to Russia. For decades, biologists in the Chesapeake Bay region assumed Atlantic Sturgeon were virtually extinct, harmed also by pollution and dams. A few old adult sturgeon were found at the far southern end of the Bay – in the James River – but there were no young anywhere, foreboding ill for the survival of the species. But then… something miraculous happened. Starting in 2011, scientists at Virginia Commonwealth University began building a sturgeon breeding ground out of boulders on the bottom of the James River, because sturgeon eggs get smothered by sediment and require hard bottoms to hatch. This fall, for the first time, biologists began to find baby sturgeon around the new breeding ground, near Hopewell. First, in October, their sampling nets found four….then 24…then 148….then 167 – so many, they had a hard time keeping track. Greg Garman is the Director of the VCU Rice Rivers research center. “Well, I think the first reaction was kind of disbelief. Because this has been a research objective of ours for probably seven years now,” Garman said. Garman suspects that this year’s record-breaking rainfalls – although often seen as bad for the bay, because more rain flushes more fertilizer and other pollutants off the land – may have provided an unexpected boost for baby sturgeon. 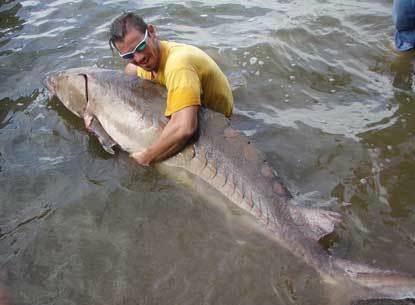 The discovery inspired hope about a possible sturgeon comeback among many fisheries biologists, including Chuck Stence at the Maryland Department of Natural Resources. The Nanticoke, on Maryland’s Eastern Shore, has a tributary called the Marshyhope Creek, where researchers have found, caught and tagged 24 adult sturgeon over the last four years. Now Stence says biologists plan to return next spring to see if they can find any baby sturgeon – perhaps also helped by this summer’s extreme rainfall. It’s not yet clear how many of the juveniles found this fall will survive…but the bay, in general, has been getting cleaner over the last seven years, which is good for sturgeon and other fish. So it’s not impossible that a slow recovery of these ancient monsters …could begin.